Should I Give Directly To The Poor? By Tim 8 Comments - The content of this website often contains affiliate links and I may be compensated if you buy through those links (at no cost to you!). Learn more about how we make money. Last edited February 10, 2014 . Are they really in need? Will money help them get ahead or just cause keep them on their same path? That’s my human side showing. I think it’s natural to think these things and to try to rationalize situations that put us in a difficult situation – wondering whether it’s right to give or not to give. As I began to think it over further, I realized that making a strict decision NOT to give to those in need because of these questions is NOT the right move. Nor is it right to give to every person who is holding up a sign asking for money. So How Do You Know When To Give? Notice this verse doesn’t mention money. That doesn’t mean we’re exempt from giving money directly to those in need. The point is to make an effort to understand their need and to help them meet it. That might mean food, shelter, clothing, or financial assistance. Put reason aside and don’t pass judgment. It’s easy to jump back to those questions that plague our mind, which often keep us from giving. When you see someone in need and can help him or her, reflect back on that verse and do what you can to help. Actively look for ways to help. If you’re really wanting to be more generous and the idea of giving money to the first person that asks is hard to accept, try being more proactive with your giving. I suppose there can be an entire article (or book!) about ways to give, but the underlying point is to encourage an attitude of giving that will help you best discover ways to meet the needs of others when it’s in your power to do so. I may be the only one who struggles with this hesitation to give directly to the poor, but my attitude is reshaping as I constantly remind myself of what I shared above. What do you think about giving directly to the poor? What’s the best approach to take? i JUST had this exact conversation yesterday with a friend of mine and i came to some of the same conclusions as you do. 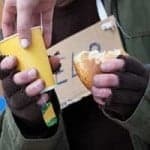 when you see a homeless person in need, as in your example, there is no way to know how they arrived to their situation unless you stop and ask and learn. is it because of a mental condition, drugs, personal choice, etc…? and let’s say you find out what the reason is, do you still give? if the person is mentally ill, what will $5 do? is there somewhere you can take this person to get the help they need, and if you can, is it your duty to? there are so many more questions to be addressed. but if we open up this discussion to a much wider scale, we can ask ourselves endless questions about when we should/shouldn’t intervene when we see someone in need, not just limiting it to the poor or homeless individuals. but going back to your question, i’ve made a conscious decision not to give directly to the poor because i don’t have the resources to learn about each of their situations in full (there are many here in LA). that would be ideal. what i have done in the past is volunteer for homeless shelters and served the community who reached out for help. it was much farther reaching, and didn’t require me to make the choice of what to give. i gave my time, my energy, and my ears, listening to those who needed it. I typically haven’t given directly to the poor, but like Danielle, more to my local shelters, our church and to local food shelves/etc. While i don’t think I’d necessarily never give to someone directly, sometimes I feel like the money is better used and for more people when i give to organizations that can use the economies of scale to have a greater impact. Our local food shelf for example can use a $1 donation to get $9 worth of groceries. My wife on the other hand is a bit more soft-hearted than I am in many instances I think, and is much more inclined to give directly to people and talk to them. Probably something I need to consider doing more often, and softening my heart a bit. I have experience giving directly to the poor. One time I was working in Little Rock Ark. and I was at a gas station. A homeless man came up to me and asked me for some money. I had been asked so many times I decided to actually question the man about his situation. We sat down and he went on and on about some story that was so crazy that I didn’t believe one word of it. Finally, I told him that I would take him into the gas station and buy him some chips and a drink. We went in and he started picking up all kinds of beer and food and I told him I was only getting him chips and a non-alcoholic beverage. He put the other stuff back and got a bag of chips and a drink. Then as we were leaving he asked me for more money because his wife and children were starving. I did not believe him and told him I couldn’t give anymore. As he walked away, I saw him go across the street to a group of people laughing and hollering. He sure didn’t look like a man with a family starving. Anyways, I don’t like giving money directly to poor people. I usually go through churches. Give money directly to the poor? No. Purchase an item for someone asking for money? Certainly. Give a ride to the homeless shelter to someone needing help. A very, very, very cautious *maybe*. Too many people begging for money that will use that money to buy something that will only dig them deeper into the hole they’re already in. I echo the sentiments and moral of the story from Fire Finder’s comment above. TC – It would be difficult to give anyone a ride (homeless or not). It’s just a little too risky for me. Maybe there’s a better way to do it. IDK – call a cab/pay for it. I definitely agree with you though. I think this is really where the heart of the believer is tested. Most of us will give to organized (and well known) charities without much thought and believe we’ve done our Christian duty. But then we’ll run into a homeless person and turn him away, telling ourselves that he’s a phoney who doesn’t want to work and proabably will use the money for alcohol or drugs. Meeting over, our conscious is clear. Maybe it shouldn’t be. When we do that we’re judging the circumstances of the homeless person as if we have absolute knowledge of his situation. In addition to being un-Christlike, our assumption of omniscience has to be a complete abomination to God. This is just my thinking, but I think that the poor are more likely to see the face of Christ in our direct giving of either money or effort, than they will if the same is delivered by an organization. The verse you used is actually refering to indebtedness, “to whom it is due”. However the scriptures do talk about generosity. These verses have been helpful to me. If your enemy is hungry feed him, if he is thirsty give him drink. If a man will not work neither let him eat. This takes a bit more than just handing out cash to whomever asks. It’s relational. When I lived in a big city I found if someone was willing to wait for you to get them a sandwich they were on the level about being hungry. There was usually little time to actually talk to them and find out what got them there. I learned you don’t give cash, the scriptures talk about food and clothing, and that’s been a helpful benchmark. When we lived in South Dakota it was easier to set up a “work for food” situation. This keeps someone’s dignity intact too. And for people who consistantly asked for help it became a way to develop an ongoing relationship. If all our resources belong to God and we, as much as is in our power, seek to honor Him with our use of them, if someone takes us, they’re actually stealing from God. We can be prudent and still be openhanded. We know we’re to provide for our own household and like the Proverbs 31 woman then open our hands to the poor. So there are boundaries to it. If we don’t have it to give, that’s OK too. As an aside. It’s amazing the reactions you get when you give in Christ’s name and the kinds of discussions you find yourself in.